alaTest has collected and analyzed 5 reviews of Hitachi UltraVision DZGX3300A. The average rating for this product is 3.7/5, compared to an average rating of 4.0/5 for other Camcorders for all reviews. People really like the image quality and battery. The design and price also get good opinions, but there are some negative opinions about the color. We analyzed user and expert ratings, product age and more factors. 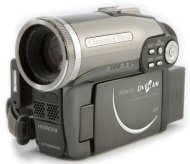 Compared to other Camcorders the Hitachi UltraVision DZGX3300A is awarded an overall alaScore™ of 76/100 = Good quality. There's nothing memorable about the quality and features of Hitachi's dreadfully named DZGX3300A camcorder. Decent low-light video quality; solid battery life; in-camera editing. Hidden touch-sensitive controls; poor auto white balance for stills. If you're looking for a relatively inexpensive DVD camcorder with decent image quality, the Hitachi DZ-GX3300A might be for you. The DZGX3300A could be more intuitive to use, but for the price you'll get a small, light device with excellent picture quality.